Have you ever wondered what makes butterflies and moths special, and what makes them different? Have you ever walked upon a butterfly, became so enamored by its beauty and wanted to know what it is but really had no idea what to call it? Well, now your questions will be answered with the book Butterflies and Moths: All About Butterflies and Moths, A Kids Introduction to Butterflies and Moths! This book is guaranteed to capture the attention of every kid and kid at heart out there. With the help of this of this book, you will learn about: The life cycle of butterflies and moths; How butterflies get their colors and what makes them different from each other; What are the differences between butterflies and moths; What are the behaviors of butterflies and what do these behaviors mean; How to rear butterflies and so much more! You will also learn about different kinds of butterflies and moths, such as: Queen Alexandra's Birdwing; The 88 Butterfly; Atlas Moth; Luna Moth; Clearwing Butterfly; Brimstone Butterfly; Rice Paper Butterfly; Ghost Moth; Madagascar Sunset Moth; and Wasp Moth, among others! And, at the end of the book, there are questions that you may want to answer to see if you understood what you heard and make the book more fun for you! 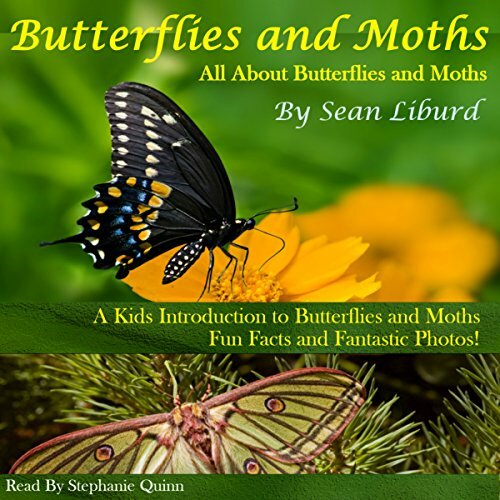 Listen to this book now and impress your friends with your knowledge about moths and butterflies.